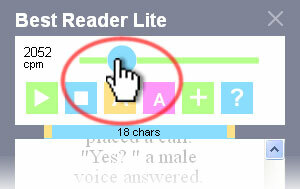 Best Reader Lite is not only the effective instrument to read quickly Internet sites (RSVP - Rapid Serial Visual Presentation reader), and as well as a nice simulator to develop speed reading abilities. Due to these valuable skills you can read not only more books, newspapers, magazines, but do it faster. You will always keep abreast the world news, and your friends will be surprised at your knowledge. 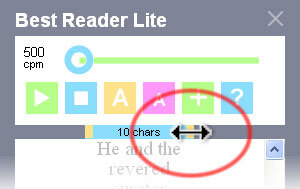 You can read more rapidly after some days using our program. 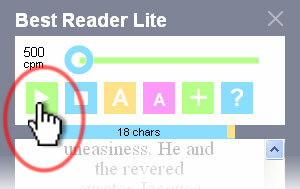 In order to get to know about slow reading causes and find the additional information on speed reading you are welcome to go to our web-site readerssoft.com. 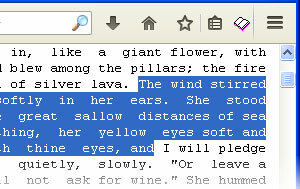 If you'd like to read only a part of the text, select it before. 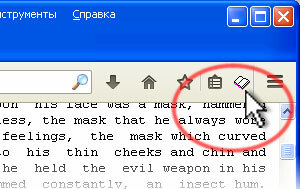 To launch a program, click the “book” icon on the add-ons panel. Set up the width of the field of sight appropriate for you..
Set up the reading speed suitable for you. The speed measures symbols per minute. During reading watch in the centre of a marked line. Do you like our program and you wish to support out project? Please donate it.